We will help you grow your business; plus, we will pass you work! Since 2001, the SpinVax has been one of the leading professional air duct cleaning systems on the market. 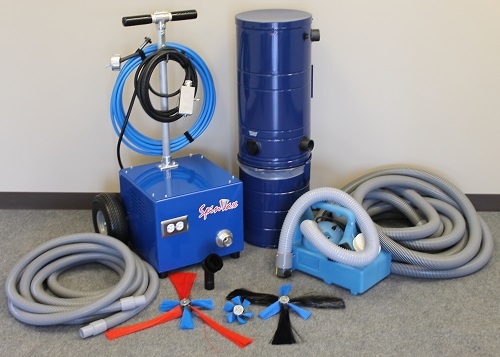 The SpinVax Air Duct Cleaning Equipment has helped many professionals around the country expand into the air duct cleaning market. Now, new & improved, the SpinVax 1000XT Air Duct Cleaning Equipment Package contains everything you need to clean air ducts and dryer vents. Combine the low cost of ownership with features & technologies not found in any other air duct cleaning system, and you have one of the best air duct cleaning and dryer vent cleaning equipment packages you can find anywhere. Air Duct & Dryer Vent Cleaning: Why purchase additional equipment to do both, when the SpinVax 1000XT system has everything included? Package Design: Notice, the SpinVax 1000XT is a complete package. No big, heavy equipment to transport or carry. This “package” design allows for simple, one-man operation. FlexTendTM Brush Technology: Unique technology with angled reverse directional sweeping action that automatically self-adjusts to the duct size. Circular or Rectangle, Metal or flexible… the included FlexTendTM Brushes are safe & effective. The SpinVax 1000XT comes with 3 self-adjusting size brushes: Standard (ducts 4-18in. ), Large (ducts 18-24in. ), and Dryer Vent (3-4in.). Brush & Vacuum Separation: Unlike other systems that connect the brush to the end of the vacuum hose, the SpinVax 1000XT separates the cable & brush from the vacuum hose. This allows the technician to actually navigate through the twists & turns found in ductwork and prevent vacuum hose clogging. Professional Look: The SpinVax 1000XT now only works great, but looks great! This air duct cleaning equipment package gives your company the professional image it requires. Pricing: Why pay more when you can purchase right from the manufacturer, CleanCraft, with factory direct pricing? Proven: CleanCraft has been selling the SpinVax since 2001. Now, we have redesigned the SpinVax 1000XT to make it even better. With the new sleek design and the improved FlexTendTM brushes, CleanCraft makes it easy to be an air duct cleaning professional. Don’t lose work to your competition! Training Video: The System comes with a training video to fully train all cleaning technicians. This system makes it a simple, one-man operation. Guaranteed* Jobs: Companies that purchase the SpinVax 1000XT system can get free membership into our Network where we pass along scheduled work to your business! More about our Network & Guarantee. 1000 RPM - Optimally set speed control for cleaning efficiency. With 6 brush strips, that is 6000 Brush Strokes per Minute!!! Soft Fillament in FlexTendTM Brushes – Gentle to use on all types of ductwork, yet, sturdy enough when spinning to effectively dislodge and remove dust, dirt, & debris. High Powered Z-Vac Vacuum – Made for the SpinVax with 2 inlet ports for standard and thinner vacuum hose included in the package. Permanent HEPA Filter Bag – No need for disposable bags in the Z-Vac. The permanent HEPA filter bag keeps contaminents from the exhaust, while the bottom canister collects the dirt & debris for easy removal. Remote Control w/ Belt Clip – Handy remote fits on technician’s belt/pocket for easy access and control of the SpinVax 1000XT. On/Off & For/Rev. Cord & Cable Hooks – Store your power cord, remote cord, and even flexible cable right on the SpinVax 1000XT machine. Convenience & easy transport. Built-in Dolly Design – Incorporates a “T” style handle with large, no-flat wheels for easy dolly operation. Easily go up & down stairs, and around the house or building being cleaned. As a small business owner, purchasing the SpinVax 1000XT Air Duct cleaning equipment was one of best decisions I have ever made for my business! Not only is the equipment incredibly easy to use, but it works and works well. Tech support is always available for any questions I have. And CleanCraft's marketing program has booked me several air duct and dryer vent jobs making my purchase of the SpinVax 1000XT well worth the money! training for four days. I arrived home on Sunday and watched the DVD on the set up and operation of The SpinVax 1000XT. After watching the video it took 30 minutes to set up and operate. Monday morning I was doing a vent duct cleaning job and everything went nice and smooth, very easy to maneuver and operate!